Written for the exhibition Untitled Selves: New Work by Frank Rodick, The School of Image Arts, Toronto, 2018. It lasted years, not months; and during that long season of falling apart I watched those last waves of stardust sweep through my parents, breaking them into pieces. It took long enough never to stop, and so little time it was ash before it began. It was my season for watching, and forgetting how to sleep. I did strange things I'd never done. Like make pictures of that sorry little trio we were, that we'd always been. First came the pictures of Frances, my mother. A few years of that, and then came the portraits of my father, Joseph, a lonely man who grieved he might not outlive us all. I spent more time poring over his pictures than I ever spent on the man when he was alive. Squeezed in there somewhere was another discovery: three old snapshots in yet one more old shoebox, pictures of a smooth-bellied four year old boy standing naked in a bathtub. The boy was long gone, but I'd been taught to recognize him as me. I tried blowing up that thin white body and turning him inside out; I christened my churnings with flash powder and cold water, and I called the pictures everything will be forgotten. I'm sure that during this long season something broke inside me. Whatever that thing was, it likely wasn't whole in the first place. There was corrosion enough to make it crumble. Maybe that's why I wound up making these pictures, the ones I’d call untitled selves. But I lie: symmetry, that's what started me out. I wanted pictures that would go neatly with the Frances and Joseph portraits. Tidy, three-legged symmetry, nice on exhibition walls and book pages, symmetry that mirrored our little band. I made pictures starting there and they were predictably awful. Something elemental was wrong, or rather, missing. Making up a story—even the most hallucinatory, gossamer-thin story—felt wrong because it just wasn't there anymore. I was spent. So, how to make pictures of spent? How to make pictures of broken? Never mind how, because you don't know how. Who we are is something other than what we think. And that something is unknowable. So how do you ever represent that? A blank space? Maybe. Dots on a page coming together and flying apart? Maybe that too. There was less of me after that long season. A wind tunnel comes to mind; not that I was living in a wind tunnel, but that I was a wind tunnel: a big, vacant, turbulent space, where undefinable bits of things crashed into each other, coagulated for a quantum moment, and then flew apart. Sometimes one of those nebulous clusters looked familiar, like an emotion or a state of mind or a sense of self I recognized, something with a name: bewilderment, wonder, fear, hate, resignation, disgust, elation, alone. But the labels disintegrated even before things came apart again, leaving me feeling not somewhere else, but someone else. Or nobody at all. It’s obvious that identity is changeable. But what that season of falling apart brought home was something more elemental, namely, that who we think we are is transient and impermanent to the point of pure illusion. It was a relief to cut. To scrape, and winnow away the images, to scratch out eyes and seal mouths shut, to blow things up, scattering them like powder. All of it a relief, though born from effort. Three years earlier I did a dry run for this process with the everything will be forgotten and season of mist pictures. I made those images subtractively, chipping away at the black mass of surface to reveal what was below. Two-dimensional sculpting, I'd called it. Was it a coincidence that these earlier works were also self-portraits—unlike the portraits of Joseph and Frances, which used a more additive process? I doubt it, though it probably doesn't matter. I eliminated colour. I gave up on text, which I'd considered at first. I discarded or crippled other elements that some people say are key to portraiture: pose, background, lighting, context, objects. What wasn't there was as definitional as anything that was. What was left I could move around as I pleased, like the white sand I remember those monks in Kyoto gently pushing with their rakes. I sometimes say that my work beginning with the Frances pictures makes up an "alternative family album." But there's nothing in the last self-portraits that returns to my family. I wonder if I'm proclaiming my rejection using that most disparaging and disrespectful of methods (in photography and life): erasure. And yet. The images remain clearly married to the human face, which along with the figure, have been constants in my work. How's that? A man not quite ready to leave this world? Yes, though the threads are thinner now. Looking not only for what's gone, but also for what's left? Yes, that too. Fear of leaving everything behind? For sure. For now. It was tenuous, but I still felt a part of this world, of this strange production... But not a resident. More like a traveller, just passing through. Dust. To see the complete series of untitled selves, click here. 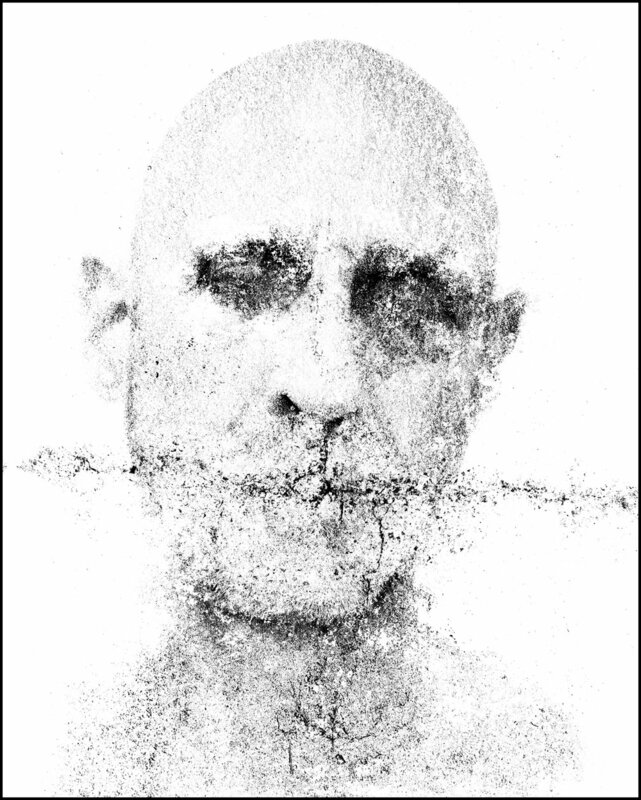 For the May 2018 exhibition Untitled Selves: New Work by Frank Rodick the artist wishes to thank in particular the following: Don Snyder, for his insight, curatorship, and support; Dimitri Levanoff, who printed these images, for his technical expertise and aesthetic input; the School of Image Arts for hosting the exhibition, as well as the Documentary Media Research Centre for its support.